I love a feature wall! I think that they add so much character to a room and they aren’t difficult to put in either. It’s also really easy to change them when you want something different because you’ve only got the one wall to decorate. 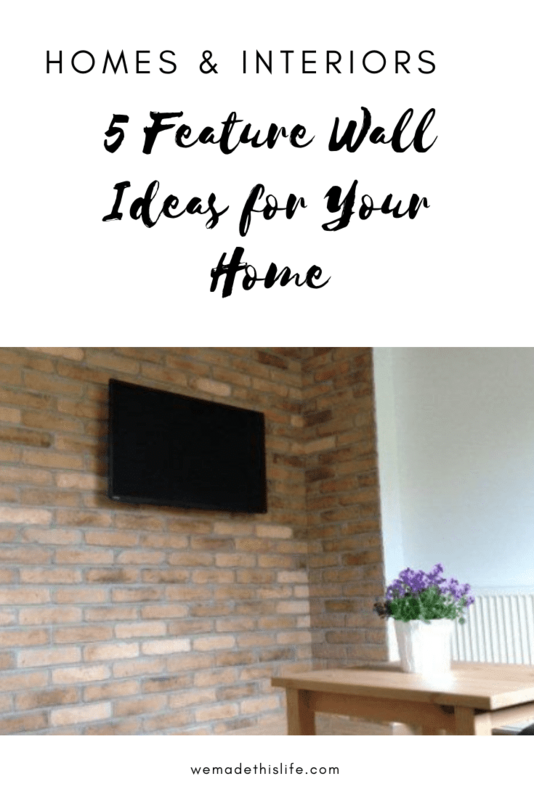 I thought I would share with you some of my favourite feature wall ideas. One option is to use brick tiles to create a stunning feature wall. These are easily fitted yourself if you are good with DIY or you could get a professional to fit them for you. These make a great backdrop and are really unique. They look great in period houses to bring a little bit of charm back into the decor. I’d love a brick tile wall in our house because I think they make an excellent photo background! A basic option would be just to paint one wall in a bold feature colour. Because the whole room isn’t going to be painted this colour you can really go for it and go for something dark, bright or even sparkly. The great thing about this option is that it is really quick to do and should only take you a couple of hours to paint. It’s also very cost effective as you will probably only need one tin of paint. A really great feature wall can be achieved with wallpaper. You can pick from a myriad of patterns to fit with your decor and wallpaper can add texture and warmth too. Wallpaper is a great idea if you have a period theme in mind for your room, such as a seventies feel as you can get some excellent reproduction vintage papers. You can really easily create a feature wall in your home now with vinyl stickers. They are easily to apply and remove should you want to change them which makes them a great choice for a child’s bedroom. You can choose from an entire vinyl wall or smaller stickers to create a particular effect. Don’t forget you can use artwork to brighten up a wall in your home. Several pictures together to form a gallery wall can be really effective or you could also hang a large canvas or print to make a real focus point on a wall. Do you have a feature wall in your home?